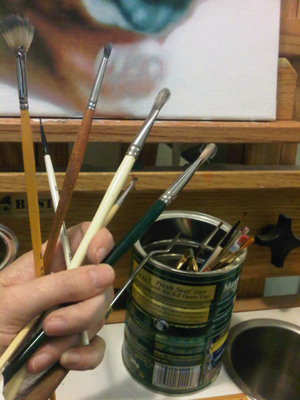 I finally get to enjoy the wonderful smell of my oil paints and feel the brushes in my hands. 😉 I begin the underpainting. 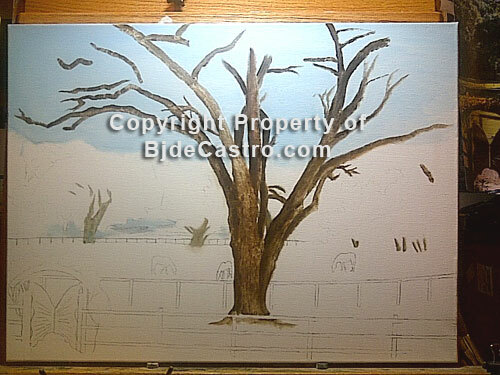 Oak trees are the most amazingly shaped trees on the planet and probably the most fun to paint. It almost looks like I have tried to finish the foreground tree trunk…but no. That is just decades of studying the abstract shapes in the trunk and branches of these majestic trees and utilizing my brush strokes in a way that the very thinned down oil paint pudddles where I want it. As the Turpenoid dries (very quickly), I am able to achieve a sense of form and tiny shapes. 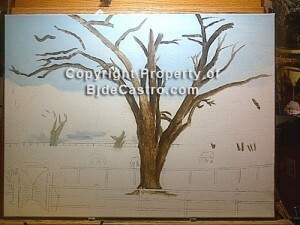 Once the painting progresses, all that you see now in the tree trunk will be covered up with subsequent layers. However this initial modeling with the thin paint helps me to make decisions for later. I am sorting out my final choices in values of light, darks and shapes to see how they will influence the perspective. A process that all artists must constantly be aware of from beginning to end.